This is my first year belonging to a CSA farm since I moved back East. I belonged to a CSA in San Francisco, but it was a wholly different experience. Each week I would get an e-mail from my friendly farmers listing what was available; then I'd go to a form on their Web site and put in my order; finally, a bag of fresh produce would be delivered directly to my office, whereupon I would pay the farmers' daughter. At my new CSA, Caretaker Farms in Williamstown, Massachusetts, I still get an e-mail from my friendly farmers listing what is available, with the added bonus that one of them (Don Zasada) includes an outstanding essay each week about life on the farm. The differences are that I pay an annual share price and I go over to the farm myself once a week to fill up my regulation-issue canvas tote. I think it's right-minded to support local farmers and sustainable agriculture, but it still took me a while to work myself up to joining Caretaker, since I wasn't sure I wanted to be tied down to another grocery run every week. The happy surprise is that going to the farm isn't a chore by a long shot. For one, the farm is located in a gorgeous spot, and going into the barn and seeing all those freshly harvested vegetables, with damp soil still clinging to some of them, is an aesthetically rich experience. It's also a great place to feel like part of a community . . . I'd heard this so many times I didn't want to hear it any more, but it's really true! The farm is always laced with other share members, who are feeling relaxed and happy and inclined to stop and chat with you in a way that just wouldn't happen in the supermarket, where everyone is just dying to get away from the fluorescent lights and mechanical blips of the checkout counters. Maybe the best part of all at the farm is that they have a pond there, and every Saturday morning we spend about an hour with our son trying to net frogs. 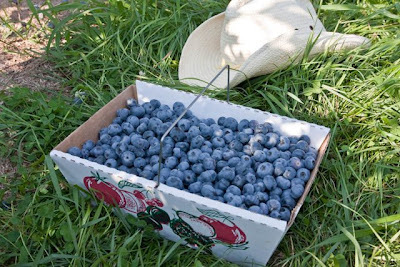 Last weekend, my family and I went to Whitney's Farm in Cheshire, Massachusetts, to pick blueberries. 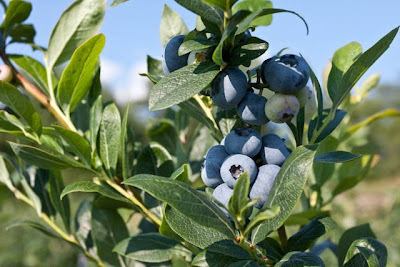 With our bountiful harvest, we ate the blueberries plain by the quart-load, gave some to our neighbors, made blueberry ice cream, and only had enough left to freeze a single jarful. I had meant to try my rookie's hand at more preserving methods, but in the end there wasn't enough to save for tomorrow, especially when we could enjoy them today! since my husband got an ice cream maker for his birthday in June. 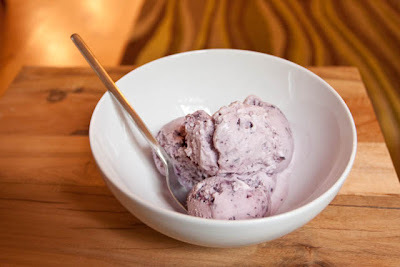 This week we flavored our batch with blueberries. 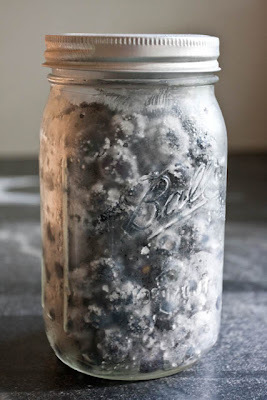 I mixed the blueberries in sugar before freezing.